What a lovely, meaningful story. 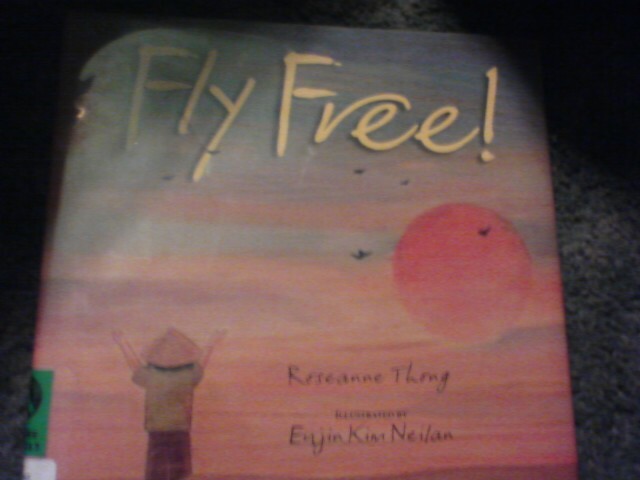 Roseanne Thong is a favorite author of my daughter’s and mine, so when we heard our book club was going to read Fly Free! by Thong at our next meeting, we both were excited to hear it. Unfortunately, we had to miss book club because my husband needed the car for work, so we had to wait and get the book from the library later. Nevertheless, the book finally found its way into our home, and after reading it, all I could do was delightfully sigh. What a beautiful book! It is the tale of young Mai in Vietnam. Mai wishes to free the sparrows for sale by the temple, but she has no money. Instead, she sings a song while feeding the sparrows about how when you do a good deed, it comes back to you. Her friend, listening to the song, pays the favor forward when she gives a shoeless, hurt girl her own shoes, and the kindness keeps passing from one person to the next throughout the book. I did have an issue with some of the kindnesses. Two of the kindnesses paid by men—a man who gave a woman a ride and a monk who helped a sick boy—were conditional. Wouldn’t the monk heal the sick boy with or without a paid kindness? And the man asked the woman he provided with a ride for one of her cakes in exchange since she had no money. Could he not have simply given her one, and then taken a cake later if she offered it? Otherwise, it’s a lovely story about the circle of kindness—indeed, the author explains about karma and samsara, or the wheel of life, at the back of the book—and the illustrations are just as lovely, lined with pretty watercolor brushstrokes. In fact, they gave me goosebumps, as once my fifth grade teacher consoled me when I white-outed the lines in a drawing I had done on notebook paper and despaired over the marks. “It could be your trademark,” she told me gently. “It makes your art different from everyone else’s.” I never did adopt the practice of lining out my art, of course, but her kindness reminds me of the kindness in the book, too. In the sky so blue!